This article contain C# code example to import CSV file data into DataTable and insert bulk records into SQL server database using SQL Bulk Copy. 1. Import CSV file into DataTable C#. 2. Insert Bulk records into SQL Server using SQL Bulk Copy. We can read data from CSV file in many of custom ways. In this article, I am going to write the C# code to read data from CSV file into .NET DataTable by using TextFieldParser. don't try to search this class in C# library because which is not available in C#. TextFieldParser is the Visual basic class. 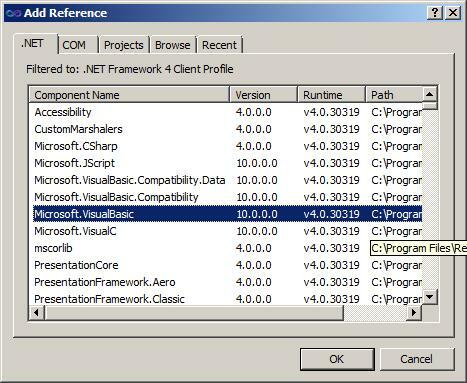 So we need to add reference dll Microsoft.VisualBasic. Go to File ->New ->Project. Rename the project name as ReadCSVFile. You can use the following code example to read data from CSV file in C# and pass the DataTable object to the function InsertDataIntoSQLServerUsingSQLBulkCopy which is available in below section (Insert Bulk records into SQL Server using SQL Bulk Copy). You can import CSV File into C# DataTable using the function ReadDataFromCSVFile which is available in above section (Import CSV file into DataTable C#). You can pass this databale object to the following function to insert into SQL Server using SQL Bulk Copy. Just a few corrections. In C# you dont say function when you declare a method and the inputs csvData and csvFileData do not match. Were you high when you wrote this article? i am working on import functionality from CSV file. here are the data for it. Mobile field contains "," delimiter so second mobile number goes to Address Field. can you please tell me how to restrict this type of value truncation..
i want to ask from you that there is any method to assign this csv file data to their data types when importing csv file to sql server? The code above is working where my data from datatable is added into sql DB but only in the 1st column of database table. I need datatable to match with 1st row from Csvfile to the columns of database table then add according data to that column. Your code rock! Thank you. Is there a way you can help me also on how to import mulitple CSV file?